Automatic Compactor for Bitumen Testing - Automatic Compactor for Bituminous Mixes: Rugged construction to withstand hard work, Fully automatic and easy to operate Uniform compaction, Automatic Preset Blow Counter Specification : The Automatic Compactor eliminates the laborious process of manual compaction and an even degree of compaction is achieved. The driven mechanism lifts the weight of 4.5kg and drops it through a correct height of 457 mm. The rammer foot is removable, which facilitates preheating. A compaction pedestal with specimen holder is fixed to the base. An Automatic Blow counter enables the number of blows to be present before each test and automatically stops the machine on completion. 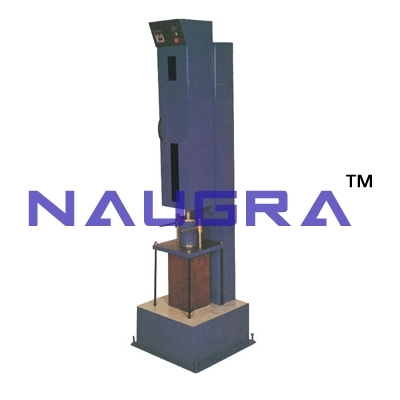 Suitable for operation on 230 V, 50 Hz, Single Phase, A.C. supply..
We are leading manufacturers, suppliers & exporters of Automatic Compactor For Testing Lab for Bitumen Testing Lab. Contact us to get high quality designed Automatic Compactor For Testing Lab for Bitumen Testing Lab for schools, colleges, universities, research labs, laboratories and various industries. We accept bulk orders for government tenders in all countries around the globe.